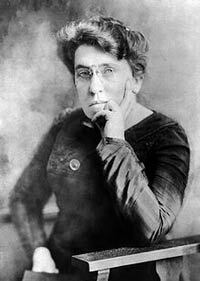 Emma Goldman was a well-known anarchist, rebel, feminist, and an ardent proponent of free speech and birth control. She played an important part in the distribution and dialogue of anarchist political philosophy in Europe and North America in the 20th century. Emma was born in a Jewish family in Russia on June 27, 1869. She lived in the Lithuanian city of Kaunas with her father, Abraham Goldman, and mother, Taube Bienowitch. She experienced a troublesome youth as she grew up in a family that she described as not providing her with enough love. Her father lost all that they had in a business, leaving very little for the family to live with. To avoid getting married early, Emma immigrated to the U.S. in 1885 with her sister, Helena. Within a few years, her parents also moved to the U.S. due to extreme anti-Semitism that they wanted to escape. Goldman got married in 1887 and then moved to New York two years later. She became an activist in the anarchist movement soon after and later became one of the more well-known and outspoken American radicals, writing and lecturing on anarchism, political topics, and women’s rights. Emma, along with her friend and lover, Alexander Berkman, who was also an anarchist, planned to assassinate Henry Clay Frick, who was an industrialist and financier, as an act of propaganda of the deed. This meant that violence was considered acceptable, but only as a means for inciting the crowds to revolt. They both did this because they thought by killing a representative of a cruel system, the consciousness of the people would become aroused and they would revolt. But the assassination never happened. Berkman did, however, manage to injure Henry Frick. As a result, he was sentenced to prison for 22 years. Emma tried to explain and justify their assassination attempt, but this only made her a marked woman in the eyes of authorities. She was caught by police and put in a Blackwells island penitentiary in 1893 for urging the unemployed to take bread forcefully. Emma was arrested and put in prison for the second time for illegally distributing birth control literature. In 1906, she founded Mother Earth, which was an anarchist journal. In 1917, Emma was put in jail for a period of two years for her involvement in organizing rallies against WWI and setting up “No Conscription” leagues. Afterwards, both Emma and Berkman were stripped of their U.S. citizenships and sent back to Russia. After returning to Russia, Emma was initially supportive of Russia’s Bolshevik Revolution, but she later changed her views and voiced her opposition for the repression of independent voices and use of violence. She composed an article entitled My Disillusioned Russia in 1923. She also wrote her auto-biography – Living My Life – while traveling through Canada, France, and England. After the outbreak of the Spanish Civil War, Goldman travelled and supported the anarchist revolution in Spain. Just six months before the start of the Spanish revolution in 1936, Berkman committed suicide. Goldman died four years later in 1940 and is now buried in Chicago near the Haymarket Martyrs.